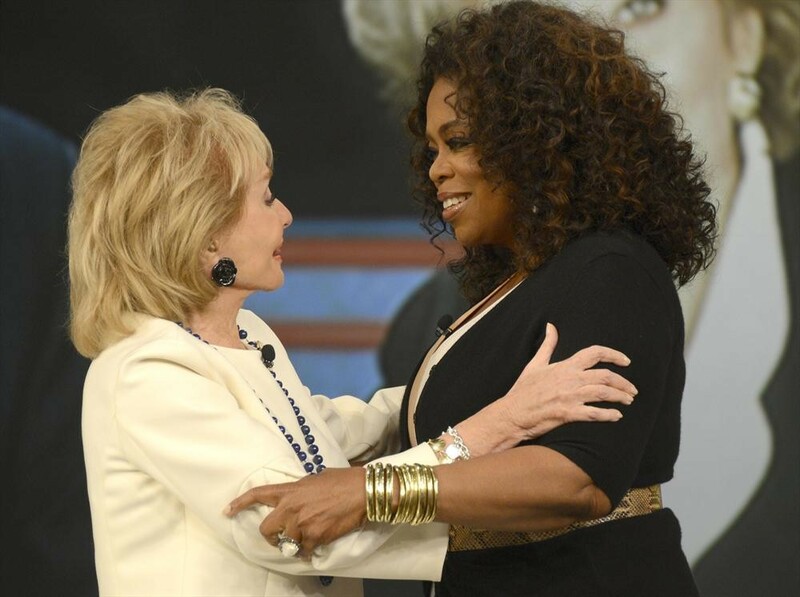 Barbara Walters spent her final day on "The View" surrounded by many familiar faces -- from Hillary Clinton and Oprah Winfrey to Michael Douglas, along with other surprise guests. Walters, who began her TV career on NBC's "Today" show in 1962, launched "The View" 17 years ago, and in 2013, the 84-year-old journalist decided it was time to retire as co-host of the show (though she'll have a behind-the-scenes presence as executive producer). And not surprisingly, the trailblazing TV host departed "The View" in style, leaving a lasting imprint on journalism, television and women. During her visit to the daytime talk show, which taped Thursday in New York, Clinton spoke about women and making choices in life -- from marriage to having children. "The most important thing is how we treat each other and how we think about the future...That means we have to be kinder...more empathetic...It all starts at home...with who you are a person," said Clinton, who was also there to promote her new book, "Hard Choices." "I thank you for coming on. It was a surprise," said Walters, the first-ever female network TV host. Douglas spoke about Walters' interviewing skills, noting that she treated him (as a young actor) the same as she would presidents and dignitaries. Walters' co-hosts also managed to slip in a question about Douglas' personal life. Last year, Douglas and his wife, Catherine Zeta-Jones, announced they were taking a break. But after stepping out together recently, the ladies wanted to know if that's still the case. "We're good. I think if both parties want to work it out, it works out," he said. Winfrey came out next, saying, "Of course I'm here...to celebrate what you've meant to me. You have literally meant the world to me." "I want to thank you for being a pioneer...to pave the road we all walk on," she continued. "I want to thank you for the courage it took to get up every day and sit in that chair....And I thank you for the stamina...You're really the reason why we're all here." And they really were all there. Women journalists from all decades and networks joined the stage, including Jane Pauley, Katie Couric, Gayle King, Savannah Guthrie, Deborah Norville, Connie Chung and countless others. "This is my legacy...these are my legacy," said Walters as she looked around at the women. "Now having had this amazing career...how do I walk away and say goodbye?" Walters said. "Who knows what the future brings? Maybe instead of saying goodbye I should say 'a bientot,' which in French means see you later," she added. Then joking about not being able to leave the set without a plug, Walters fittingly promoted Friday's two-hour special celebrating her life and legacy, which will air on ABC at 9 p.m. ET. She hasn't seen it yet, but heard "it's wonderful." "When all that is done, I can take a deep breath and enjoy my life," she said.